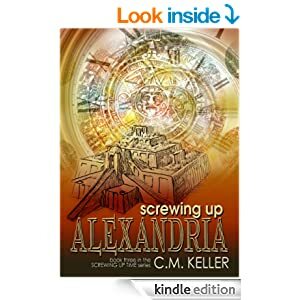 Yesterday Screwing Up Alexandria was released! This is the third book in the Screwing Up Time series. I think Screwing Up Time might have been the first book I ever bought when I got my own kindle, and it is still one of my favorites. I had the opportunity to beta read Screwing Up Alexandria, and absolutely loved it! She is awesome. 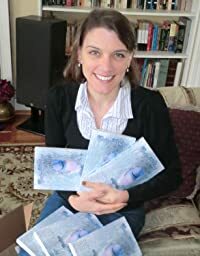 Of course, I only know her through the internet, but someday she'll come to Maine to do a book signing, and we'll go out to dinner and talk like we've known each other forever. She's super interesting and smart as a whip. I'm so glad to know her. I love YA books with a male protaganist, but they can be hard to find. That, combined with the awesome historical settings and the exciting action would earn 5 stars from me. But you throw in a fun time-travelling romance, and I'm totally hooked. Screwing Up Alexandria would be a great book to read all by itself. But Screwing Up Time is only .99 at amazon right now, so I recommend the whole series! Mark Montgomery's life is easy until he meets Miranda, "with her I-just-escaped-from-a-Renaissance-Fair clothing. Only, she hasn't. She has come from Bodiam Castle in the Middle Ages and demands a secret ingredient and a book of recipes for traveling through the treacherous colors of time. Although Mark has never even heard of either before, he must find them, or Miranda will die. To save her, Mark must break into a psych hospital to visit his grandfather who once tried to kill him, pass through the colors of time, take on a medieval alchemist, prevent Miranda's marriage to a two-timing baron, and keep it all hidden from his parents." Babylon, one of the most powerful and notorious empires ever, is the last place Mark wants to go. But when he discovers his girlfriend Miranda has been kidnapped and given to the king as a concubine, he travels through the colors of time to rescue her. It won’t be easy, not when the Hanging Gardens are a trap, his life is the prize in a game, and time is a prison. It will take all Mark’s cunning, the help of his friends, and a crazed chimp to free Miranda. When he does, time itself begins to unravel, and a life must be sacrificed or no one will survive. When Mark comes home from Babylon with a coded tablet, he never dreams someone would be willing to kill to get it. But they are. So Mark and Miranda kidnap an ancient cryptographer named Nin and take her to the Library of Alexandria to decipher it. The search for the truth of the tablet takes all of them to the most dangerous time on earth. And when Nin ends up on an altar surrounded by blood-thirsty crowds, only Mark can save her. But he’s blind. *Often people ask how you keep a story fresh when you're writing a long series. I think that's a great question because it is one of the biggest challenges. But writing time travel is great because it gives me opportunities to explore new cultures and new people. In book one, Mark explored the Middle Ages and got to meet Miranda. In book two, he and Miranda went to Babylon and met Niri. In book three, Mark explores Alexandria, Uruk, and the future while meeting Nin and a whole host of secondary characters including a zoo keeper (until I started researching, I didn’t know that the library at Alexandria had a zoo) and a Jack Sparrow lookalike. *Was this book harder to write than the others? In some ways it was the easiest because after being in the characters' heads for so long, I really know them and their voices. But even more, in my personal life, my family was going through a lot of scary health crises and sometimes it was bliss to be able to escape all my stresses and go to Alexandria, Uruk, and even the future with Mark and Miranda. And there's nothing like shooting a Taser at an evil character for some serious stress release. *Yesterday, a writing friend emailed me and said, "Do you know Screwing Up Alexandria is number one in sales in one of its Amazon categories?" I didn't. That was so cool. I can't wait to see what today brings.